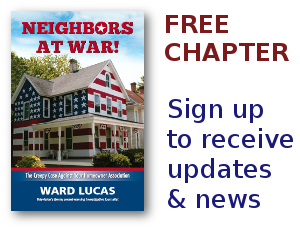 HOA Abuse Archives - Page 2 of 88 - Neighbors at War! Millions of people around the world have opened their homes to Airbnb, the service that for a small price can find homeowners willing to share their homes for a brief time to travelers. It sounds like a wonderful idea. When a close relative of mine died in Oregon and I couldn’t find a nearby motel I turned to Airbnb for what changed from a few days to a month-long ordeal. In a neighborhood of hundreds of homes I added just one extra car to the daily traffic. This is such a bad idea. Homeowners Associations are linking arms with the credit reporting industry to hammer the credit scores of homeowners late on their HOA dues. Horrible direction for this crooked, crime-filled HOA movement to take.